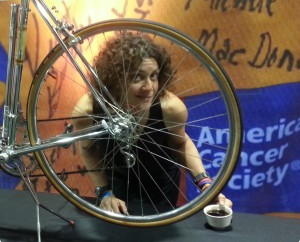 Century Cycles Blog: Help Cleveland's Shelli Snyder Recover! Shelli Snyder is a friend of the Cleveland cycling community, as a founding member of Bike Cleveland, and a fixture riding or volunteering at many local bike events. While cycling from Cleveland to Seattle, on September 18, Shelli was struck from behind by a vehicle in Montana. As of this writing, she remains in a hospital in critical condition. Thursday, September 22 - Platform Beer Company (4125 Lorain Ave, Cleveland) - $1 from every beer sold will be donated to Shelli's fund. Saturday, September 24 - Mahall's (13200 Madison Ave, Lakewood) - CLE 4 Shelli, a benefit concert with live local bands, featuring Smack Daddy & The Woodies, Exploding Lies, and Orchard Groove. Doors open at 7:00pm; $10 cover. Sunday, September 25 - Yoga Love for Shelli Snyder at Jefferson Park (3551 W. 133rd St., Cleveland). 45-minute all-skill-levels yoga practice. Donations accepted, prizes, snacks. We'll also be accepting donations at our Costume Party Night Ride on the Towpath Trail at the Century Cycles store in Peninsula on Saturday, September 24. If you can't attend any of these events, you can make a donation at the GoFundMe site set up by Shelli's friends.